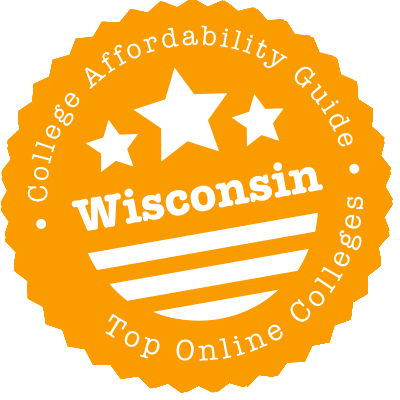 Scroll down to see the top not-for-profit colleges and universities in Wisconsin offering online degree programs. Concordia University - Wisconsin offers four associate degrees, eight bachelor's degrees, and 30 Master's degrees entirely online: an Associate of Human Resource Management, an Associate of Health Care Management, a Bachelor of Science Completion - Diagnostic Medical Sonographer, a Bachelor of Science Completion - Radiologic Technology, a Bachelor in Business Management, a Bachelor in Human Resource Management, a Bachelor in Management of Criminal Justice, a Master of Science in Education, a Master of Science in Nursing, a Master of Science in Organizational Leadership & Administration, a Master of Science in Education - Special Education, a Master of Business Administration (with a concentration in Risk Management, Public Administration, Marketing, Management Information Systems, Management, International Business, Human Resource Management, Finance, Environmental Studies, Corporate Communication, or Accounting), a Master of Science in Informational Technology and more. Online students do not need to be online at specific times in order to participate in classes. There are deadlines and exam dates, but students can complete coursework whenever it is convenient. Classes begin in January, May, and August, and financial aid is available for students that qualify. Northcentral Technical College's Virtual College takes the flexibility of online learning to the next level. With Virtual College, students can start courses when they want, set their own pace for how quickly they move through the coursework, and even set the due dates for assignments when they have conflicting responsibilities that interfere. Courses begin weekly, and students can start whenever they want, up to 10 weeks into the semester. They have between four and 16 weeks to complete the work. NTC also offers online late-start courses, and not all of these are self-paced like the Virtual College classes. UWM Online ranked in the top 50 on U.S. News and World Report's list of online bachelor's program in 2017. At UWM Online, standard social science curriculums mingle alongside a nursing degree and high-tech baccalaureates such as the BS in Diagnostic Imaging and the BS in Information Science & Technology. Minors and certificate programs are also well-represented online. At the master's level, education, healthcare and translation degrees predominate, while graduate certificates are fairly numerous, especially for library science students. Finally, the school rounds out its top-to-bottom focus on healthcare professions by sponsoring two online nursing degrees at the doctoral level. University of Wisconsin - Stout offers nine undergraduate degrees and nine graduate degrees entirely online: a B.S. in Career, Technical Education and Training, a B.S. in Management, a B.S. in Digital Marketing Technology, a B.S. in Golf Enterprise Management, a B.S. in Professional Communication and Emerging Media, a B.S. in Human Development and Family Studies, a B.S. in Special Education, a B.S. in Information and Communication Technologies, a B.S. in Sustainable Management, an M.S. in Technical and Professional Communication, an M.S. in Training and Human Resource Development, an M.S. in Construction Management, an M.S. in Vocational Rehabilitation (Rehabilitation Counseling Concentration), an M.S. in Education, a P.S.M. in Conservation Biology, an M.S. in Information and Communication Technologies, an M.S. in Manufacturing Engineering, and an M.S. in Sustainable Management. They also offer a number of professional certificates and certifications. Fall classes begin in September and October, there is a short winter term beginning in December, spring classes begin in January and March, and summer classes begin in May, June, and July. Financial aid is available for students who qualify. Madison Area Technical College offers students a range of flexible learning options that allow them to fit college classwork into their busy life. Of these, fully online coursework offers students the most flexibility, and MATC offers the most flexible programs in this format. Nearly 20 associate degrees and diplomas are offered online, along with a handful of career certificates. True to the school's name, many of these online programs are technical in nature, such as Microsoft Office or medical billing, preparing people for the workforce. But students desiring a bachelor's degree can complete a transfer associate degree online, finishing up their general education requirements. MATC's transfer contracts with some universities help smooth the transfer process. Students who take online classes through Moraine Park Technical College can transfer those credits to about 40 colleges and universities that have transfer agreements with the college, including 13 campuses of the University of Wisconsin. The college has about 20 programs that can be completed online, including associate degrees, technical diplomas, and certificates. It even has an online apprentice program in wastewater treatment plant operations. Most of the online programs are in the field of business, including associate degrees in accounting, business management, and leadership development. Other online degrees include water quality technology and health information technology. Online classes are delivered in a variety of session lengths, including four, six, eight, and 16 weeks. University of Wisconsin - Platteville offers two undergraduate degrees and seven graduate degrees online: a Bachelor of Science in Business Administration, a Bachelor of Science in Criminal Justice, a Master of Science in Criminal Justice, a Master of Science in Engineering, a Master of Science in Project Management, a Master of Science in Distance Education Leadership, a Master of Science in Integrated Supply Chain Management, and a Master of Science in Organizational Change Leadership. They also offer several professional certificates. Online courses are offered in full fall, spring, and summer semesters beginning in January, May, and August. Online courses do not require students to be online at certain times. However, some courses may require proctored exams. Financial aid is available to students who qualify in the form of scholarships, grants, and loans. Students of University of Wisconsin - Platteville can purchase necessary software at a discount. Online classes are taught by experienced faculty, many of which teach the same courses on campus. University of Wisconsin - Green Bay offers one associate degree and three bachelor's degrees: an Associate of Arts and Sciences, a Bachelor of Applied Studies in Integrative Leadership Studies, a Bachelor of Arts in Integrative Leadership Studies, and a Bachelor of Business Administration. University of Wisconsin - Green Bay has agreements with many technical and community colleges, which makes it easier for students who transfer to University of Wisconsin - Green Bay after completing an associate degree. Students who take online courses are able to complete the coursework whenever it is convenient, which makes online degrees a great option for students who work full-time jobs. Students can take classes in 14-week fall and spring semesters beginning in August and January as well as four-week, six-week, and eight-week sessions in the summer beginning in May, June, and July. In addition to grants, scholarships, loans, and other financial aid that students may apply for, privately funded scholarships specifically for online degrees may also be available to students who qualify. Fort Valley Technical College has 37 programs that can be completed online, including associate degrees, technical diplomas, and certificates. The largest number of programs, 15, are in the field of business and management, including accounting, professional communications, and supply chain management. The next biggest group of programs is public safety, with associate degrees in forensic science and criminal justice, and certificates in fields such as private investigation and cybercrime investigation. Manufacturing programs include an associate degree in industrial engineering technology and a Lean/Six Sigma Green Belt certificate. Fort Valley has a good job placement record, with 49 of its academic programs, including on-campus programs, having a 100 percent placement rate. Milwaukee Area Technical College combines the convenience of online degrees with extra speed by offering accelerated options for three of its online programs. The accelerated Associate in Arts is a transfer program that allows students to finish the first two years of a bachelor's degree in five sessions of full-time study. Each session lasts seven or eight weeks, and students can start in January or August. The accelerated marketing management degree is designed for adult learners and takes 16 months. The IT networks specialist accelerated degree takes about 18 months. MATC also offers nearly two dozen associate degrees, diplomas, and certificates online for students who don't want or need an accelerated program. Western Technical College is a two-year vocational school, so each of its online programs are at the certificate (semester-long), technical diploma (yearlong) or associate degree (two year) levels. The most basic is its Associate of Science/Liberal Arts degree, which loads students up on general education credits so they can transfer to a four-year college; the school's courses automatically transfer into online baccalaureates at UW-Green Bay and UW-Oshkosh. The remainder of the credentials are designed to put people in jobs. All are related to business, management or marketing. The university offers distance learning and online programs through its Lifelong Learning and Community Engagement department (LLCE). The online Bachelor of Liberal Studies (BLS) has three areas of study: Leadership Development, Liberal Studies and Organizational Administration. The online Bachelor of Applied Studies (BAS) has four areas of specialization: Fire and Emergency Response Management, Leadership and Organization Studies, Aviation Management and Public Safety. A BA or BS in Human Service Leadership and a BA or BS in Criminal Justice can also be earned online. There are four online certificate programs: Certificate in Fire and Emergency Response Management, Leadership and Organizational Studies Certificate, Leadership Development Certificate and Organizational Administration Certificate. The university uses Desire2Learn (D2L) as its online learning management system. The university offers the following bachelor's programs online: Business Administration (BBA), Liberal Studies (BA or BS), Political Science (BA or BS) and Early Childhood Education (BSE). In addition, the university has three online graduate certificate programs: Applied Behavior Analysis (ABA) Certificate, Autism Specialist Certificate and a Transition Certificate. The following graduate degrees can be earned online: Master of Science in Special Education: Emphasis in Professional Development, Master of Business Administration, Master of Science - Professional Development and a Master of Science in Environment Safety and Health. The university uses Desire2Learn (D2L) as its online learning platform to deliver online courses and facilitate student-instructor communication. The School of Continuing and Online Learning at Cardinal Stritch University currently offers four degree completion Bachelor of Science (BS) programs online: BS in Business Management, BS in Nursing (RN to BSN), BS in Respiratory Therapy, and BS in Business Administration. Applicants to the BS in Business Management program must have a minimum of 48 semester hour credits and at least two years of full-time work experience. Students must complete a capstone course and write a major paper in order to earn the degree. The BS in Respiratory Therapy program requires students to have an RRT (Registered Respiratory Therapist) credential from the National Board for Respiratory Care (NBRC). Applicants must also hold a valid respiratory care license. The university offers two online programs on the graduate level: Master of Business Administration MBA) and Master of Science in Educational Leadership. Students accepted to the MBA program can expect to earn their degree after 18 months of continuous enrollment. There are two available areas of concentration - healthcare management and marketing. Applicants with a valid Wisconsin teaching license who wish to acquire principal or director of instruction certification are encouraged to explore the MS in Educational Leadership program available online from the university. Gateway Technical College offers more than 15 programs entirely online. Some of these programs are available on demand, including the associate degree in accounting. On-demand classes have 36 start dates per year, and once the course starts, students have 15 weeks to complete all the work, although they can work ahead if they choose. On-demand classes are always available so there is no need to schedule around desired classes that are already full. Unlike many technical schools, Gateway has a study abroad option. Global Scholar classes align with academic programs and generally run for two or three weeks during breaks in the academic calendar. Gateway provides up to $750 in funding to help students cover global program costs. The online offerings at Chippewa Valley Technical College fall into a few categories, including education and business. For those interested in working with young children, there are programs in child care services, early childhood education, and foundations of teacher education. Those interested in business can earn degrees in human resources, organizational leadership, or business management. One of the newest online programs is an associate degree in professional communications, which prepares students to work for a variety of media doing business or technical writing. Online classes are delivered asynchronously, which means students do not have to be at their computer at a set time to attend class. Online education programs are offered throughout the University of Wisconsin System through the eCampus. UW-Madison has an online RN to BSN program for Wisconsin residents only. The following online graduate programs are available through eCampus via UW-Madison: Electrical and Computer Engineering (MS), Engineering in Engine Systems (ME), Engineering Management (ME), Engineering Technical Japanese (ME), Library and Information Science (MA), Mechanical Engineering - Controls (MS), Mechanical Engineering - Polymer Engineering and Science (MS), Professional Educators (MS) and Sustainable Systems Engineering (ME). There is a Business Spanish Certificate as well as a Technical Japanese Studies Certificate, which can both be earned online. In addition, there are over 40 non-credit professional development and personal enrichment classes available online through UW-Madison. The University of Wisconsin-Eau Claire has three master's programs that can be completed online. The MBA program is offered through the University of Wisconsin MBA Consortium, with four University of Wisconsin campuses involved in the project. Instead of traditional standalone courses, the curriculum uses integrated modules that are arranged around themes. On average, students complete the 30-credit online program in 30 to 36 months, and there is no requirement to visit any campus during the program. The online Master of Science in Communication Sciences and Disorders is designed for part-time students, who can finish the program in three years. Candidates who complete the degree are eligible for licensure in speech and language pathology. Students begin the online program in the summer. The University of Wisconsin-Eau Claire's online Master of Science in Data Science is a 36-credit program that was designed with input from industry leaders. Applicants should have a bachelor's degree with a GPA of 3.0 or higher. Applicants should have taken prerequisite introductory courses in statistics, computer programming, and databases, although relevant professional experience may be substituted for formal coursework. Marian University's online courses are designed for adult learners, whether they are starting college for the first time, returning to complete an undergraduate degree, or want to earn a master's degree or certificate to advance their career. Undergraduate degrees offered include business administration, criminal justice, homeland security, operations and supply chain management, and psychology. Marian also has online degree-completion programs in the health care fields of diagnostic medical sonography, radiologic technicians, and nursing, (RN to Bachelor of Science in Nursing). Master's degrees available online include Master of Arts in Education (M.A.E.) in Special Education, M.A.E. in Educational Technology, M.A.E. in Religious Education, Master of Science in Organizational Leadership, and Master of Science in Thanatology. Marian also has online programs for a graduate certificate in nurse educator and in thanatology. In all of Marian's online programs, most courses are delivered in an asynchronous format so that students do not have be online at a set time to participate. The University of Wisconsin Stevens Point offers undergraduate degree-completion programs and master's degrees through UW-Stevens Point Online. Class formats vary, with some classes offered asynchronously, and others requiring students to log on at a set time for at least some class sessions. Graduate degrees available online include the Master of Science (M.S.) in Data Science, M.S. in Natural Resources, M.S. in Community and Organizational Leadership, M.S. in Geodesign and GIS Techniques, M.S. in Sustainable and Resilient Food Systems, M.S. in Education, and a special master's degree with a focus on early childhood education and early childhood special education. The program in early childhood education allows students to take courses through any UW campus or private college and transfer the credits back to Stevens Point. The online degree-completion programs typically require students to have at least two years worth of college credit before they enter the program. Options include degrees in health information management and technology, health and wellness management, business, American studies, and a Bachelor of Science in Nursing for registered nurses. Online certificate programs include health and wellness coaching, add-on certifications for teachers, paralegal, and project management. The University of Wisconsin-La Crosse offers two bachelor's degrees and six master's degrees through online programming. Several certificate programs are also available online. Online courses are offered primarily in an asynchronous format, giving students the option of logging on when and where it is most convenient for them to do coursework. The Bachelor of Science in Health and Wellness Management is a degree-completion program offered by a consortium of Wisconsin schools. The Bachelor of Science in Health Information Management and Technology is a degree-completion program, and it also offered by a partnership of University of Wisconsin campuses. The 30-credit MBA program is another consortium project offered online. Three Master of Education programs are offered online: reading, professional development, and student affairs administration in higher education. The University of Wisconsin-La Crosse also has online programs leading to a Master of Science in Data Science and a Master of Science in Medical Dosimetry. Three online certificate programs are offered by the Department of Education Studies and the Institute for Professional Studies in Education. Those programs are the Educational Leadership Certificate-Principal, Professional Learning Community Certificate, and English Language Arts Elementary Certificate. Students pursuing the online Master of Business Administration (MBA) degree at Edgewood College can enroll in classes at their own pace since the program does not adhere to a cohort model of education. Many MBA courses follow an accelerated format, with a new course beginning every eight weeks. In addition to the MBA program, there are two other Master of Science (MS) degrees that are offered online by the School of Business: MS in Accountancy and MS in Organizational Development. Each degree is comprised of 30 credits. Accountancy students who pursue the degree on a full-time basis can expect to graduate from the program within one year. Students can also enroll in the program on a part-time basis, in which case, they can expect to earn the degree after two years of continuous enrollment. There are currently two doctoral programs offered online: Doctor of Nursing Practice (DNP) in Leadership and Doctorate in Educational Leadership. The DNP program follows a hybrid system of delivery. The Doctorate in Educational Leadership program offers a concentration in higher education. Edgewood College currently offers two online licensure programs in bilingual education: Teacher License in English as a Second Language and Teacher License in Bilingual Education. Wisconsin Lutheran University offers several education master's programs online, and adult learners who want to finish their bachelor's degree can enroll in an accelerated program in business. Graduate programs offered online include a Master of Arts in High Performance Instruction, M.A. in Leadership and Innovation, and M.A. in Instructional Technology. The college also offers a transition to teaching program for professionals seeking teaching licensure; the program has a hybrid format with online and in-person elements. Applicants to these M.A. programs must have a bachelor's degree and a teaching license, and they must submit two recommendations, a personal goals statement, and a professional writing sample. The college may require applicants to attend an interview. The accelerated degree-completion program is designed for working adults who want to complete a Bachelor of Science in Business Management and Leadership. Wisconsin Lutheran uses a prior learning assessment process to grant academic credit for learning gained through professional training and life experiences. Undergrads may be able to transfer up to 80 credits. Most Wisconsin online certificates and degrees emanate from the state’s public colleges and universities, with a few private colleges getting into the game. To determine how to approach distance learning in the state, we’ve created a guide that covers the essentials: the main avenues to an online degree in Wisconsin, descriptions of the most affordable and reputable programs, and a rundown of schools in hot water with accreditors. eCampus gives you full access to the University of Wisconsin system’s 13 universities. If you’re certain your first step is a certificate or associate degree, you can search for programs and individual courses at the 13 underclassman colleges (known as the University of Wisconsin Colleges) via the UW Colleges Online website. You can also see all of UW’s online programs in one place at UW Help. Or you can search via individual UW websites. If you don’t want a full program, but know you want to get a UW degree, visit Distance Learning.Wisconsin to get the full picture. The website as a whole is not kept up-to-date, but the course entries are. With 16 technical colleges, the WTCS has plenty in the way of online education for vocationally minded students, whether you want to get an undergraduate certificate, a noncredit certificate or an associate degree. The WTCS even has two liberal arts transfer career programs in online and/or hybrid formats for those who want to continue on to a bachelor’s degree. You can do an advanced search for these and other online and hybrid career programs at a separate Wisconsin Technical Colleges website. Before you rule out a hybrid program, keep in mind that many of the technical colleges run multiple locations and have excellent coverage across the state, making it possible for adult learners to attend evening and weekend classes. See Lakeside Technical College‘s or Milwaukee Area Technical College‘s explanations of course formats. One of UW Extension’s primary initiatives is the UW Flexible Option. Got a lot of practical work experience but not necessarily in-class exposure? The UW Flexible Option can give you credit for skills learned outside the classroom and put you on a self-paced trajectory to earn whatever credits remain. There are five degree programs at the associate or bachelor’s level and five certificate options, but a good starting point is the Online Associate of Arts and Science, which will cover general education coursework needed to earn a baccalaureate. Other colleges in Wisconsin allow students to transfer in credits based on life and work experience by passing a DSST exam or similar assessment — including schools on our list: UW-Platteville, UW-Whitewater, UW-Eau Claire, UW-Green Bay, UW-La Crosse and Wisconsin Lutheran. One more thing: The UW System also makes it easy to know what credits will transfer between schools, especially because all UW colleges share one curriculum. Go to Transfer Wisconsin to see how other institutions’ courses and degrees will transfer. Wisconsin is a member of the Midwestern Higher Education Compact, which runs the Midwest Student Exchange Program. That means you can enroll as an online student in participating colleges in Illinois, Indiana, Kansas, Michigan, Minnesota, Missouri, Nebraska or North Dakota and get reduced tuition — earning 10% off at a private school or paying no more than 150% of the in-state rate at a public one. However, each school is allowed to set its own eligibility criteria, so you’ll want to contact a campus administrator when applying. School contacts are listed under the “View details” button of the school search page. When you’re looking at online degrees, affordability means little without quality. The schools below offer both. But don’t feel like you have to take our advice! You can double-check graduation rates, student loan debt and other quality and affordability indicators at College Scorecard. UW-Eau Claire is part of the University of Wisconsin MBA Consortium, which U.S. News & World Report ranks very highly. Look to the school’s Business Office for tuition and fees info. Nontraditional learners who have been away from school for awhile can apply for a grant from the Returning Adult Student Fund, which hands out $21,500 in awards per semester to both online and traditional students. They can also take up to six credits a term without seeking a UWEC degree. These “Special Students” choose courses after enrolled students are finished and can apply for the Returning Adult Student Fund grant. Last, the school offers noncredit courses starting at $99 via a partnership with Ed2go. Education programs dominate UW-La Crosse’s catalog, and the school’s online degrees and certificates are all at the master’s level, though students can take individual courses at other levels. Undergrads taking online courses are treated no differently than fully on-campus students when it comes to financial aid and school costs, which are nicely laid out on the Tuition and Fee Information page. While online graduate students also use the same financial aid route as their on-campus peers, they should visit their program’s page for tuition details, as some programs charge identical tuition to residents and nonresidents. Students virtually attending UW-Oshkosh programs from outside the state pay the same per-credit tuition that Wisconsin residents do. They’ll choose between bachelor’s, graduate and certificate programs, some of which are run through the Division of Lifelong Learning and Community Engagement (formerly known as the Division of Online and Continuing Education). But you can find a separate (and slightly different) list of online programs elsewhere on the school website. Though UW-Platteville Online offers just a handful of bachelor’s and graduate degrees to go with its certificate programs, it features on four separate U.S. News & World Report rankings for online programs (criminal justice is a strong choice). The school makes relevant distance education scholarships easy to find, and residency is not a factor in tuition. Distance education students in the Platteville area also have the option of paying a fee to utilize health services, campus child care and other benefits, depending on whether they feel this will save them money elsewhere. UW-Stevens Point rates among the least expensive places to get a four-year degree in the state! Visit UWSP Online to see which degrees and individual courses it offers. In 2016, it changed its tuition and fees structure so that online enrollees pay a $50 per credit distance education fee but none of the fees traditional students pay. Some programs require nonresidents to pay out-of-state fees, while others do not. If you’re searching for a variety of online programs, UW Stout is on the higher end of the spectrum compared to other UW campuses. Online students receive free tutoring through Brainfuse, and the Customized Instruction Scholarship is purpose-built for distance ed students. It hands out $14,000 a year in awards to undergrads and graduates. The school directs all online students to its Financial Aid Office for further information. When it comes to quality markers, U.S. News & World Report ranks UW Whitewater‘s online MBA and online bachelor’s programs quite highly. One key to the school’s affordability is that it includes undergraduate textbook rental within the quoted tuition price. The university encourages online students to discuss distance education fees with their program coordinators, as these can vary from degree to degree, but financial aid opportunities are the same university-wide. WTC’s Online Degree Programs include a variety of career-focused associate’s degrees plus a slick University Transfer Program that allows you to easily transfer online credits to a four-year university (think big savings on the first 2 years). The tuition section will give you a rundown on prices; Non-residents usually pay more than Wisconsin residents, but out-of-state students in tough financial situations can apply for a tuition waiver. Financial aid and scholarships can also help to defray costs. Wisconsin Lutheran touts its Adult Accelerated Degree Program, which can be taken online. It rolls tuition, fees and books for the 48-credit program into one overall cost. While it happily reports that many of its students qualify for employer reimbursement, it has set up a web page detailing loan options for adult students who aren’t fully covered. The school also advertises its policies on credit for prior learning, which is an easy way to lower the cost of your remaining tuition. In addition to DSST, Wisconsin Lutheran accepts results from a number of other tests as well as via competency assessments. So, even if you’ve taken a noncredit course in the past, you can still earn credit for it if you’ve retained the most crucial knowledge. If a Wisconsin school isn’t accredited by HLC, it may be nationally accredited. You can use the Council for Higher Education Accreditation (CHEA) Database to find out. If the school you’re looking at isn’t on this list, it’s probably not a real school. The Minnesota Office of Higher Education revoked Globe University’s license to operate in the state after it found it to be in violation of the Consumer Fraud Act and the Deceptive Trade Practices Act. The U.S. Department of Education (DOE) then ruled that this applied to Globe’s Wisconsin campuses as well, which are barred from enrolling new students — traditional or online — while the school appeals the decision. This move drew sanctions from the school’s accreditor, ACICS, which is itself under fire from the DOE. In fact, the Department of Education has recommended ACICS be stripped of its status. As of November 2016, ACICS was appealing the decision. Saint Martin’s does not appear in College Scorecard or the CHEA Database, and it holds no recognized national or regional accreditations, nor does it have Wisconsin Educational Approval Board recognition to operate. Wright Graduate University, which uses a hybrid or blended online format for several of its graduate certificate programs, is accredited by ACICS, whose status as a DOE-recognized accreditor is in serious jeopardy, as noted above. However, accreditors do not allow schools to advertise whether they’re seeking accreditation, so Wright Graduate University may be pursuing other options under the radar. Higher Learning Commission: The HLC is is the regional accrediting body for degree-granting higher education institutions in the Midwest, including Wisconsin. Wisconsin Educational Approval Board: Though this state board is not an accreditor, as its name suggests it does authorize schools and programs to operate in the state, while also identifying which schools it does not have regulatory authority over. eCampus: Run by the University of Wisconsin System, eCampus is a portal to online degrees and courses offered at any UW school. Log on to take a free demo course before enrolling. Transfer Wisconsin: Check to see which of your private or public college coursework will count for credit when you transfer to another Wisconsin higher education institution. Distance Learning.Wisconsin: There are four ways to browse via this site set up by the UW Board of Regents — by subject, by provider, by program and even by delivery method (if you want a course taught by, say, audio conference rather than via online portal). Wisconsin Technical College Systems: Click on “advanced search” to find associate, diploma and certificate career programs via one of the technical colleges in either an online or hybrid format.